The Draper 94.5 x 168" Stage Screen Portable Projection Screen is a breakthrough in projection screen technology. It is designed to be flown (suspended) but can be used with an optional set of legs. This is a very strong and rugged screen that is marketed towards AV rental dealers. From a retail point of view, this means not having to maintain a larger inventory of separate screens since this screen can serve a wide variety of uses. From a user point of view, it saves you the cost of purchasing several screens. It is a wonderful choice for an easy-to-use, portable screen that sets up and breaks down in no time and with a minimum of effort. In its smaller version, it is an excellent choice for point-of-purchase displays while in larger sizes, it serves well in auditoriums, gymnasiums and lecture halls. Draper tests showed it to be over 60% stronger than a traditional folding truss screen. The system is completely modular with optional color coded legs designed for rapid, easy assembly. There are only 6 sections to put together - and if one of the sections becomes damaged, it can be readily replaced without any tools. Various sizes of the screen can be created from those same 6 sections - add a section and build a different size screen. The 8" truss design is considerably stronger than similar systems. The legs are manufactured with the same kind of sections as the frame itself. The legs are an optional purchase but make the screen an even more viable purchase since it then gives you two options for use - flown or mounted. By purchasing the legs, you'll have a complete system that can be used in just about whatever venue you encounter. The screen surface is held in place by DuraLoops - which are bungee cords with pull-tabs. All you need do is attach the tabs to the frame and you're ready to go. No more need for snaps that can pop out. The screen surface is tensioned and held perfectly flat yielding an undistorted image. Another "wow" point of this screen is that it can be used as a "Multi-Format" screen by exchanging or removing a few frame sections (separate viewing surface required). In addition to being a flexible system, it also cost-effective since you now have one screen that can serve a variety of formats - without the need to buy different sized screens and legs. 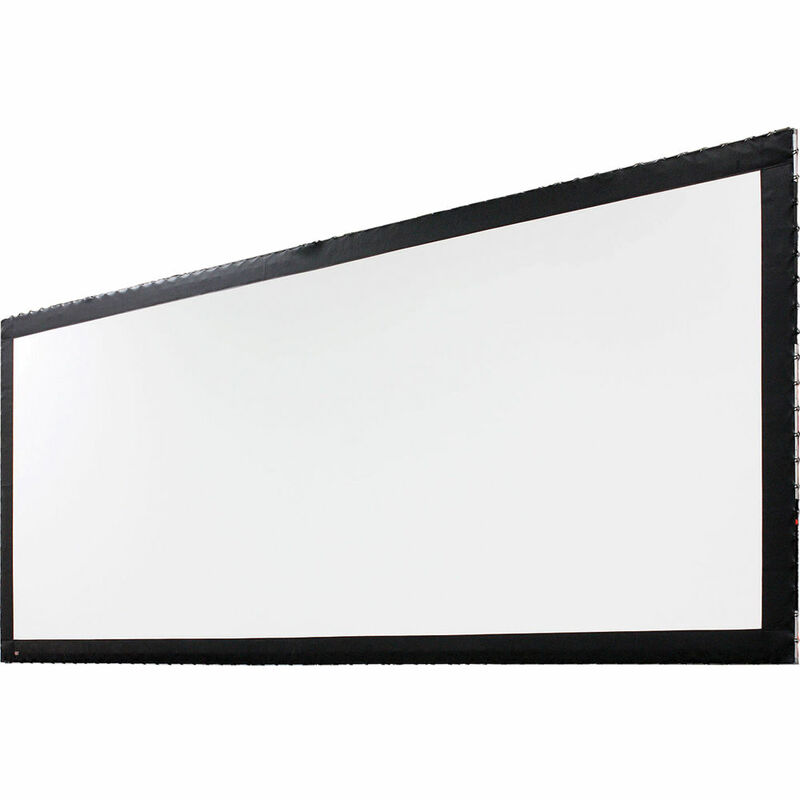 The Stage Screen is available in a variety of surfaces for front or rear projection. There is also an optional Dress Kit to further enhance the appearance of the screen and your presentation. Black-Backed M1300 -The perfect Matt White diffusing surface. M2500 -High contrast surface, good for areas with more ambient light. Cineflex -A neutral gray (1.3 gain) for rear projection. Low Gain Cineflex -A lower gain (0.8) gray for rear projection. Uniflex -A white surface suitable for front and rear projection. Specifically designed for blending applications. Draper performed in-house testing of the strength of StageScreen truss compared to a folding truss screen. The results were dramatic: StageScreen proved to be over 60% stronger, holding strong long after the folding truss failed at its weakest spots. In addition, after extensive cycle testing, the StageScreen yielded no broken parts. Box Dimensions (LxWxH) 85.0 x 21.0 x 15.0"